Some of the most fascinating personalities in the Bible are members of a royal family or dynasty. The fact that there are 99 named kings and that the word “king” appears 2,256 times throughout its pages attests to the importance of such an imperial designation. References to queens are not so plentiful—that term is mentioned only 54 times, most of which have to do with Queen Esther or Queen Vashti. The reason for this disparity is because kings governed Israel and Judah almost entirely. Only Athaliah is listed as a ruling queen in Israel, a position she murderously usurped, as we discovered last week when discussing Johosheba. Sometimes it is difficult to keep the line of kingly succession straight because of a duplication of names, or the use of alternate (aka) names. 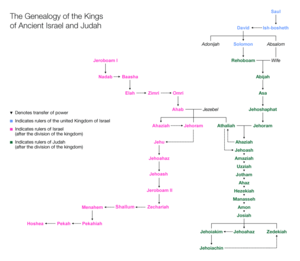 This presents a challenge when trying to follow the chronologies of the kings of Israel and Judah. For example, in 2 Kings 8:25, Jehoram (Joram), king of Judah, reigns at the same time as Joram (Jehoram) king of Israel. Careful reading and sometimes even charting and note taking are necessary to keep on track. This also holds true in the New Testament. Seven Herods reigned just before and during the first century. Herod the Great, the patriarch of the Herodian dynasty, is the infamous king responsible for the “slaughter of the innocents” (Matthew 2:16). He died in 4 B.C. Herod Agrippa 2 was the last of his line. Procurator: In ancient Rome, this was an administrative official with legal or fiscal powers. Examples are Pilate, Felix and Festus. Queen: In the context of the tribes of Israel, a term “queen” might refer to the queen mother—that is, the mother of the king. She potentially had a great deal of influence over the internal affairs of the palace, as in the case of Bathsheba, but not as the acting ruler of a nation. Often the designation is generic, signifying a woman married to a king. Two non-Israelite queens mentioned in the Bible apparently enjoyed administrative powers of position and wealth: the Queen of Sheba (1 Kings 10), and Candace, the title of the queens of Ethiopia (Acts 8:27-28). Tetrarch: Gospel accounts sometimes reference the name of a specific Herod with the designation of tetrarch: “At the time Herod the tetrarch heard the report about Jesus…” (Matthew 14:1). A tetrarch signifies a prince who governs one-fourth of a domain or kingdom (International Standard Bible Encyclopedia, topic “Tetrarch”). With all this as a backdrop, the next posts will examine the intrigue surrounding the lives of several notorious royals: Drusilla, Bernice, and the ever-intriguing and controversial Salome. Herod Antipas, brother of Archelaus. Married Herodias, wife of brother, Herod Philip 1. Herod Philip 2 (also called Philip the Tetrarch), son of Herod the Great through his fifth wife, Cleopatra of Jerusalem. He married his niece Salome, daughter of his half-brother Herod Philip 1 and Herodias. We are happy that you are enjoying our blog. Bible women are fascinating, and they always have a story to tell, don’t they? Thanks for stopping by.